Sport for athletes with an impairment has existed for more than 100 years, and the first sport clubs for the deaf were already in existence in 1888 in Berlin. It was not until after World War II however, that it was widely introduced. The purpose of it at that time was to assist the large number of war veterans and civilians who had been injured during wartime. In 1944, at the request of the British Government, Dr. Ludwig Guttmann opened a spinal injuries centre at the Stoke Mandeville Hospital in Great Britain, and in time, rehabilitation sport evolved to recreational sport and then to competitive sport. On 29 July 1948, the day of the Opening Ceremony of the London 1948 Olympic Games, Dr. Guttmann organised the first competition for wheelchair athletes which he named the Stoke Mandeville Games, a milestone in Paralympics history. They involved 16 injured servicemen and women who took part in archery. In 1952, Dutch ex-servicemen joined the Movement and the International Stoke Mandeville Games were founded. These Games later became the Paralympic Games which first took place in Rome, Italy in 1960 featuring 400 athletes from 23 countries. Since then they have taken place every four years. In 1976 the first Winter Games in Paralympics history were held in Sweden, and as with the Summer Games, have taken place every four years. Since the Summer Games of Seoul, Korea in 1988 and the Winter Games in Albertville, France in 1992 the Games have also taken part in the same cities and venues as the Olympics due to an agreement between the IPC and IOC. Also in 1960, under the aegis of the World Federation of ex-servicemen, an International Working Group on Sport for the Disabled was set up to study the problems of sport for persons with an impairment. It resulted in the creation, in 1964, of the International Sport Organisation for the Disabled (IOSD) who offered opportunities for those athletes who could not affiliate to the International Stoke Mandeville Games: visually impaired, amputees, persons with cerebral palsy and paraplegics. At the start, 16 countries were affiliated to ISOD and the organisation pushed very hard to include blind and amputee athletes into the Toronto 1976 Paralympics and athletes with cerebral palsy in 1980 in Arnhem. Its aim was to embrace all impairments in the future and to act as a Co-coordinating Committee. Nevertheless, other disability-orientated international organisations such as the Cerebral Palsy International Sports and Recreation Association (CPISRA) and International Blind Sports Federation (IBSA) were founded in 1978 and 1980. Finally, in 1989, the International Paralympic Committee was founded as an international non-profit organisation in Dusseldorf, Germany to act as the global governing body of the Paralympic Movement. 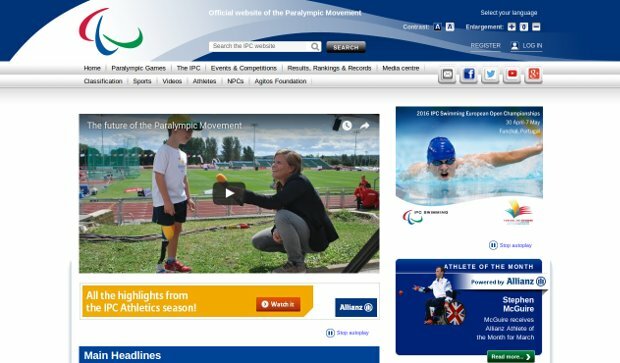 The word “Paralympic” derives from the Greek preposition “para” (beside or alongside) and the word “Olympic”. Its meaning is that Paralympics are the parallel Games to the Olympics and illustrates how the two movements exist side-by-side.